variety of funding sources to help small and large businesses and corporations relocate to or expand in Marion County. Our role is to help businesses grow by providing options in financing economic development projects. Our experience and our professional contacts allow us the ability to think outside-the –box and provide unique financing options to those businesses that may be considering Marion County their new home. Below is a short, non-comprehensive list of programs that we will explore on your behalf. Many of these financing vehicles can be used in conjunction with each other and after a discussion with you about your project we can provide assistance to you by suggesting a financing package that we will help you secure. Sales Tax Lease – The Port Authority can provide a sales tax exemption on construction materials for new construction of facilities if the business plans to retain or create new jobs within Marion County. Conduit Issuer of Bonds – The Port Authority can be the conduit issuer of taxable or tax exempt bonds. This could benefit a business or a non-profit in a number of ways, please call to discuss. 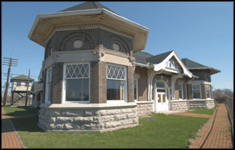 Tax Increment Financing (“TIF”) – The Marion Port Authority can work with you to maximize the TIF to its fullest potential and help facilitate the TIF with the local municipality and school district. Federal, State and Local Grants, Loan and Bond Fund Programs – The Marion Port Authority through its many professional contacts could add significant value to businesses planning to expand or relocate to Marion County. Today, there are numerous grants, loans and bond fund programs available to businesses and non-profits. These programs are available through a number of different organizations. The difficult part of structuring a complete financing package is locating, securing and utilizing different financing programs to maximize the benefit to the business owner. Marion Port Authority has the experience and resources to explore all financing options available and determine the best possible financing option for a specific project.